In a recent conversation with Steve Ferguson, vice president of Hello Health, he described how the company is identifying new revenue sources for practices while working to engage patients. Even though the company’s business model is one that sets it apart and helps it rival other free EHRs, like Practice Fusion, I left the conversation with him wondering why more venodrs weren’t trying the same thing as Hello Health: trying something no one in the market is trying to see, if by change, a little innovation helps pump some life into the HIT market. Along the same lines, myself and thousands of others in HIT have wondered why systems are not interoperable and, for the most part, operate in silos that are unable to communicate with competing systems. Certainly, there’s a case to be made for vendors protecting their footprints, and for growing them. In doing so, they like to keep their secrets close; it’s the a business environment after all and despite the number of conversations taking place by their PR folks, improving patient health outcomes comes in only second (or third) to making money. However, let’s move closer to my point. Given the recent rumors that Cerner and McKesson are working on a joint agreement to enable cross-vendor, national health information exchange, I’m wondering: Why don’t other vendors partner now and begin to build interoperable systems. According to the rumors, the deal, if completed, could shift the entire interoperable landscape for hospitals, physicians and patients. It would position Cerner, which has more EHR users, and McKesson, which has a strong HIE product in RelayHealth with a loyal user base, to take on Epic Systems, a leading EHR vendor. An announcement is expected at HIMSS13. Here’s why this is important news: Interoperability mandates are coming. Like most things, it’s really just a matter of time. Systems will be forced to communicate with other, competing systems. They should already. It’s actually a bit shocking that given the levels of reporting required of care givers, the push for access to information through initiatives like Blue Button and patient’s access to information through mobile technology that there’s not more openness in the market. The Cerner/McKesson news is incredibly refreshing and worth a look. Two major competitors may be realizing that by partnering they’ll be better able to take on each company’s biggest competitor: Epic. Imagine connected systems exchanging data. 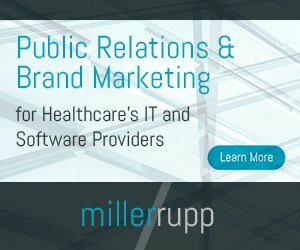 The thought alone would be marketable across several sectors of the healthcare landscape and the move worthy of reams of coverage, which would lead to great brand awareness for each and the change to do what all EHR companies aim for: To create thought leaders; to stand out; to set the market on its heels. If nothing else the partner vendors would stand ahead of the pack when future interoperability mandates are enacted and will be seen as experts in the exchange game. Tongue and cheek aside, the idea really is a good one and with no one currently doing it, it’s a great opportunity for a couple of HIT companies to actually move change forward and create an environment where information can be easily exchanged across practices, across specialties and across borders. Then, perhaps, we’ll see a real commitment to improved patient health outcomes rather than them simply trying to improve bottom lines. When someone says, “It’s just like riding a bike,” they typically mean that once you learn how to do a certain thing, you never forget. There’s something about the task or the ability of your body and mind to remember how to effortlessly accomplish the goal that just brings it back. The same can be said for breathing; perhaps even driving or swimming. But, remove the training, the time spent rehearsing or the practice attempts (you know, the fall on your head and the scars on your knees) and the whole process begins to make a lot less sense than it would had you put in the time to understand how to accomplish said task. In fact, in the example of the bike, without the practice many never get to experience the exhilaration of reaching the peak of the hill after fiercely pumping on the pedal and finally zipping like a bullet train down the other side. In that instant of wind-rushing joy, all the hard work on the first half of the hill was worth the effort of being able to experience the second half of the hill. I can’t imagine life without having learned how to ride a bike, or learning how to disappear into the pages of a favorite book because I knew how to read. Frankly, I can probably say the same thing about a few pieces of technology and software that I have been trained to use or that I have taught myself to use. Had I not learned how to use them properly, life wouldn’t be so rich. Perhaps electronic health records don’t fall into the category of technology that enriches users’ lives if used properly, but there’s apparently a connection between the level of experience one has when working with the systems and the success they’ll have using them to track health outcomes and build efficient practices if they have received proper training of the systems. According to AmericanEHR Partners, the results of a study it issued shows that user satisfaction was lower for clinicians that used an EHR but received less training than their counterparts who received more training of the systems. Essentially, the more training and experience using the systems the more likely users are to get more out of the systems. Likewise, clinicians who received less training of the systems perceived their experiences with systems as less than positive. According the study, five findings were discovered, none of them all that shocking, but certainly very telling. AmericanEHR Partners found that the more training a survey respondent had with the EHR, the happier the respondent was. Secondly, three to five days of training on the EHR was typically required to achieve the highest level of satisfaction. Fewer than half of those surveyed said they received at least three days of training. The report’s other findings suggest more training leads to happier users. In addition, according to the finding, those who had a hand in selecting the EHR were generally happier when using it than those who did not help select it. So, there are some obvious questions here, which Steve Ferguson of Hello Health asks pointedly in his blog post on the same topic. In summary, Ferguson asks: are doctors not getting sufficient training? Why? Do vendors not offer enough training? Is it too expensive? Is the doctor at fault? Well said; questions deserving of answers. In some cases, though, no one is really at fault. Vendors, looking to finalize a sale add the fewest number of training hours to the deal so as not to scare new clients away. Training hours are expensive and typically not a free service provided by the vendor. The number of training hours vendors require their clients to buy have been know to cost vendors some deals. Too many training hours can cause some practice leaders to run. In some cases, there’s often not a lot of margin in selling the EHR systems. Some vendors have even given them away to lure customers. For vendors, the EHRs are a lot like gasoline at gas stations. The stations make next to nothing by selling the gas; it’s all the convenience store items you purchase while you’re filling up that keeps them in the cash. Same can be said for movie theaters. Theaters make little profit on the movie tickets; their dough is made selling you candies, popcorn and Cokes. The point is that practice leaders are often scared by the often high prices of vendor’s training hours. Vendors sell systems so they can lock in lucrative annual maintenance and service agreements. They’ll forgo the training hours to close a deal to get to the monthly or annual client stipends. Practice leaders are sometimes like moviegoers who buy the ticket, but bring their own sandwiches and sodas from home. They think they can get by on their own or will ask for free assistance from colleagues using similar systems. In the end, it seems quite a few folks are standing around looking at the bike rather than getting on it and taking it for a spin, even though the practice and the inevitable falls is where the real value is at.